The Baseball Hall of Fame Inductions are complete. The old members have all stopped by Cooperstown and waved to the fans, welcoming this years class of immortals. The old stories have been swapped, photos have been taken and another year has come and gone of happy times in Cooperstown, Now we look forward to the debates and arguments that will ensue regarding the next class to be enshrined. One of the more interesting personalities that was part of this years class, is Pedro Martinez. Pedro came out with a new autobiography this year and it has brought varying degrees of response from the masses, so I figured I should check it out for my blog. My first reaction when I heard the release date of this book was, how ironic it was coming out in his Hall of Fame year. I guess good marketing strategies never sleep. Pedro had always been a source of controversy to some degree during his career. Early in his career he picked up the label of head hunter, mainly due to his pitching inside and making sure the batter knew who owned the plate. For the record I have no problem with that, it is a part of the game that has disappeared through the last few decades and probably something that should find a way to return. Pedro also had a well-remembered battle with Don Zimmer one time that might have made some highlight films on a few stations. But on the field it was hard to deny Pedro was an incredible competitor, No matter where he played you could always see his skill and desire, but now this book gives you the personal side of Pedro. If you listen to interviews with Pedro, he his a big fan of himself and in this book, he has no reservations in telling you why. From his on field play, to those people around him Pedro is a guy that demands respect from people and it seems he is not one to shy away from the limelight. The book starts from his growing up in the Dominican Republic and how he had struggled as a child to be taken seriously as a baseball player. His brother Ramon, signed by the Dodgers, was Pedro’s ticket to getting a serious look from a big league team. Pedro walks you through his progression from dim prospect, to major leaguer, to superstar and introduces you to all the people he met in between. He has a very long memory of those who did him wrong and makes sure you know who they are in this book. I had read some reviews of this book before I read it, just to see what I was getting myself into. Many other folks said that Pedro liked to remind the reader how great he really was. I am not disagreeing that point in any way with this book, but I don’t think it is Pedro being a conceited jerk. I think it more his immense pride coming through. He has very strong family roots and pride in his accomplishments. Also, the points he makes in the book about respect and his troubles along the way with getting any respect, it to me came off as a man with a strong pride. 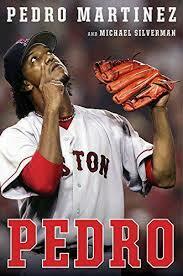 Now I say all this never being a huge Pedro fan when he was playing. The only regular first hand account of his playing days I had, where when he played half a season in 2009 for my Phillies. Even at the end of his career you could see his determination, pride out on the field and his ability to lead by example. So maybe Pedro isn’t as big of a jerk as some of the other book reviews have made him out to be. Baseball fans should check this out for themselves. Maybe I am right or maybe everyone else is, but it’s you job as the reader to make that determination, I am just one guy’s opinion, who found after reading this, a new-found respect for Pedro Martinez. No for his on the field playing, but for the person he is.